The architecture of the solver has been recently published in a JSAT system description: Daniel Le Berre and Anne Parrain. The Sat4j library, release 2.2. Journal on Satisfiability, Boolean Modeling and Computation, Volume 7 (2010), system description, pages 59-64. A getting started guide is currently under development. Your feedback about it is welcome. Please report problems and feature request using OW2 Gitlab Trackers If you need help, you can contact us preferably by sending an email to help at sat4j dot org. 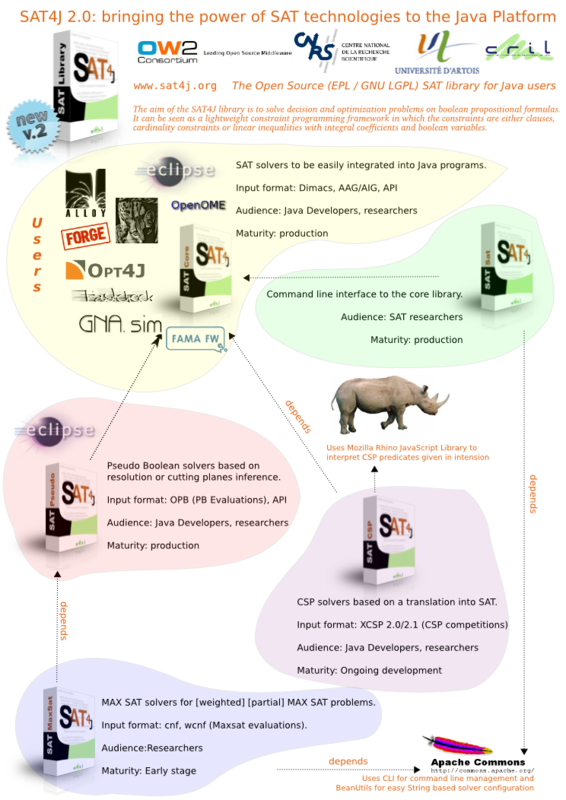 A poster showing the various dependencies of the SAT4J project can also be of some help. A web site generated by Maven 2 is also available. solves cnffile using MiniLearning SAT solver.